Mmmmmm…. comfort food on a cold and windy day. 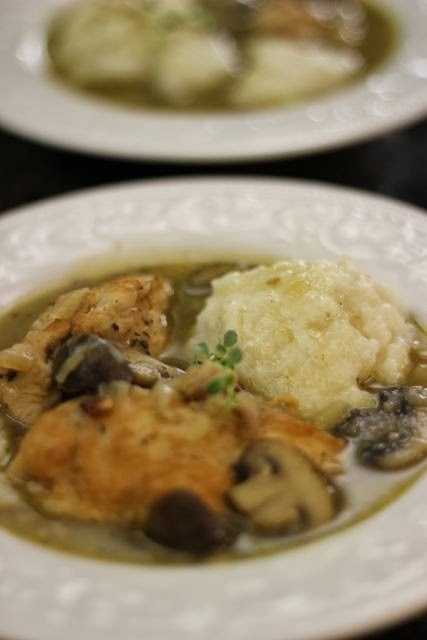 Chicken & dumplings really hit the spot. This recipe is so delicious. It's luscious without being too heavy. The flavors are amazing. 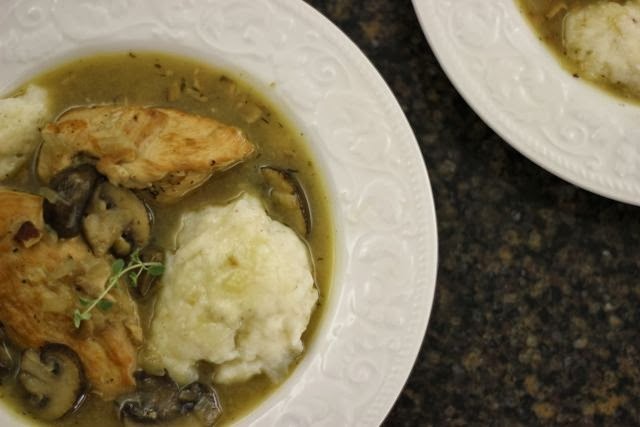 This isn't your plain 'ol chicken & dumplings with the Biquik dumplings. This is fancy enough to serve to dinner guests. It's really not too hard to make and can even be made ahead! * You can use a gluten-free all purpose flour if you want to make this gluten-free. Or you can do a combination of rice flour, sorghum flour, almond flour, and/or oat flour. In a large, deep stock pot, cook the bacon over medium heat until crispy. Transfer bacon to a paper towel lined plate. TIP: I always use a deep stock pot to make bacon for any dish (or just for breakfast). It keeps all the splatter in the pot NOT on my stove. Less cleaning! Yeah! Place the flour in a shallow bowl and season with salt & pepper. Increase the heat under the pot to medium-high. Dredge the chicken in the flour and place in the stock pot. Cook until browned on each side. You don't need to cook the chicken completely… just get a nice brown on the outside. The chicken will continue to cook later in the process. 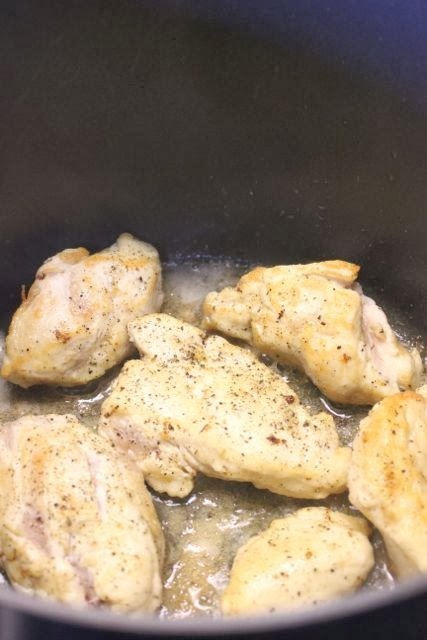 Remove the chicken from the pot and place on a plate. Next, add the mushrooms to the same large pot. Cook until golden brown, stirring occasionally. If you are using chicken breasts, or used a lean bacon, you may need to add a little olive oil if the pot is dry. 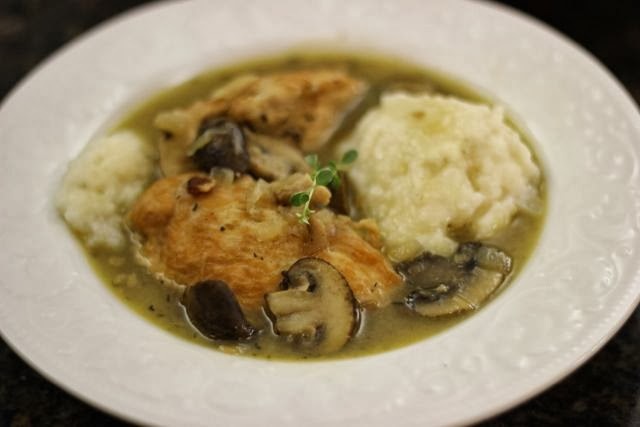 It should take about 5 minutes to brown the mushrooms. 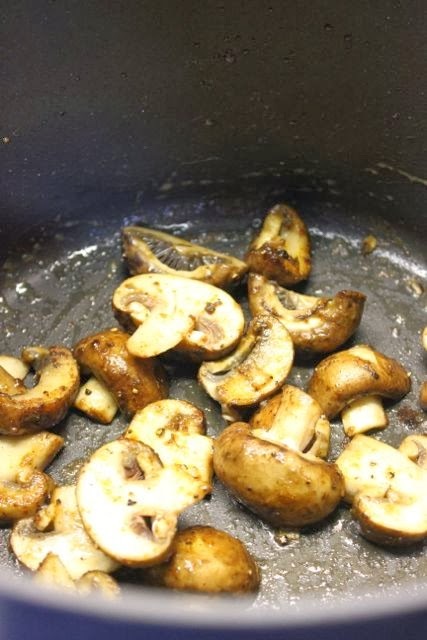 Remove the mushrooms from the pot and place in a bowl. 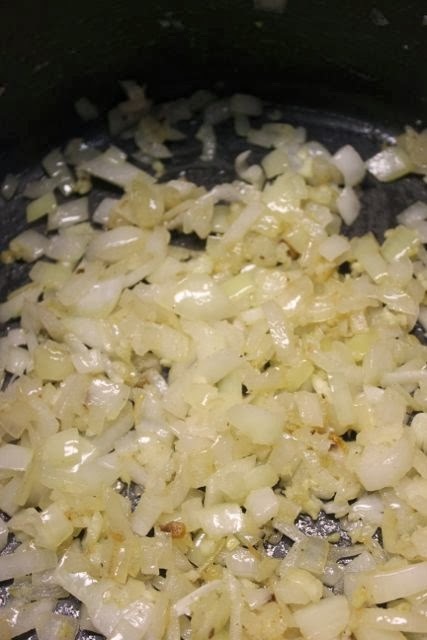 Add the onion to the pot and cook over medium heat (turn it down from medium-high) until soft and translucent. It should take about 10 minutes. Add the garlic and cook until fragrant (about 1 minute). Add the wine and simmer until reduced by about half (another 5 minutes). Now you can add the chicken broth, thyme, and bay leaves. Also add the chicken and bacon back to the pot. Season with salt & pepper. Bring to a simmer and continue simmering on low heat for 1 1/2 to 2 hours. 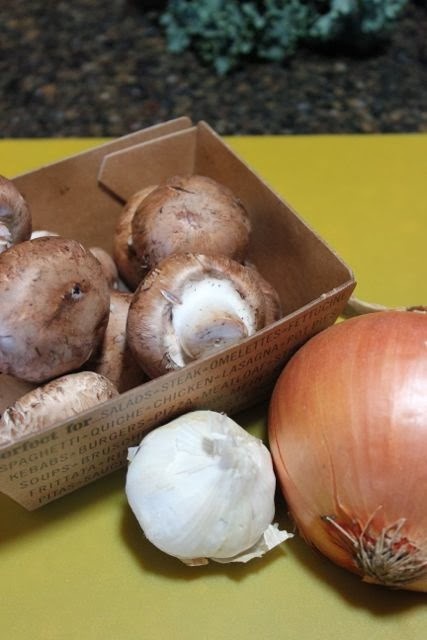 At the end, toss the mushrooms back into the pot and simmer for about 10 minutes. At this point, you can either make the dumplings and eat right away or you can all the stew to cool, transfer to a container and store in the refrigerator for up to 3 days. When ready to eat, reheat the stew and prepare the dumplings. Bring a large pot of salted water to a low boil. In a large bowl, combine all dumpling ingredients (the batter will be a bit lumpy). Drop the batter into the simmering water by tablespoonfuls and cook until cooked through and doubled in size. It will probably take about 5 to 8 minutes. Remove the dumplings from the water using a slotted spoon. You may need to work in batches. Add a few dumplings to each bowl of stew. Garnish with a fresh thyme sprig if desired. Enjoy!